Ampthill fought back from two points behind at half-time to earn a 37-12 victory over Stourbridge. Much of the first half saw the home side in control, with their fired-up pack getting over the gain line, while Amps were inaccurate in attack and ill disciplined in defence. The second period, however, was dominated by the visitors who produced a strong 40 minutes to outscore their hosts by five tries to zero. Stour turned on the power straight from the kick-off, resulting in a fourth-minute converted try under the posts from their lock after multiple phases in the red zone. Ampthill responded with a series of forward phases of their own, culminating in the ball being moved to the right on 12 minutes where left wing Gareth Clarke – on his return to the team after a two month injury absence – crashed over for an unconverted try. In the 16th minute, Stourbridge worked the ball out to the left wing where a perfectly timed offload and block by their-full back enabled their centre to crash over for an unconverted try. 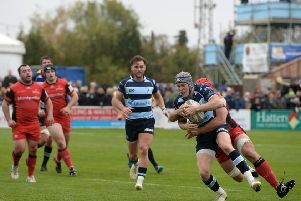 There was no further scoring until the 39th minute when loosehead prop Joseph Sproston broke off the back of a maul and touched down wide on the left for another unconverted try – leaving the score 12-10 at half-time. Whatever the visitors’ coaching team said during the break worked because Amps came out with all guns firing in the second period, raising their level and dominating every phase of the game. Tries were added through full-back Elliot Clements-Hill, a hat-trick from openside flanker Joseph Bercis, and a final score from wing Darrell Dyer – with Clements-Hill converting just one.